Series Finale' race is this Tuesday Aug. 28th. All are welcome. great door prizes & pizza party! Best four performances count towards series awards in 10-year age groups. Trail running series taking place on the east side of Chestnut Ridge Park in Orchard Park pits each runner against the clock on a weekly basis. Tuesday nights in August just got a lot hotter with a wild & wicked race series welcoming all levels of runners. Park in nearby lots, not roadside. 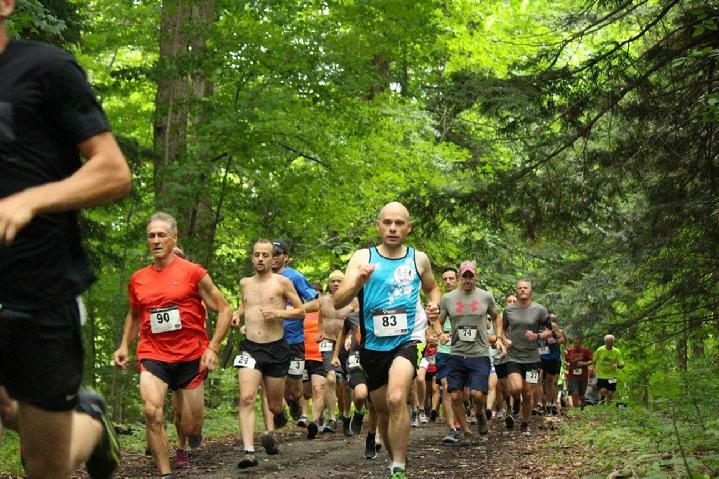 A 3.2-mile course features a taste of the wide variety of trails Chestnut Ridge offers including XC ski trails, rooty sections, slight climbs & descents in the forest, grass field crossings, some pavement and a beautiful canopy of trees. Test yourself on a weekly basis against the clock (same course is used weekly). Start time is 6:30 every Tuesday in August. Registration & # pickup from 5:30 until start time. Look for RACE signs as you enter the Park just past the Casino building. All levels of runners are welcome. 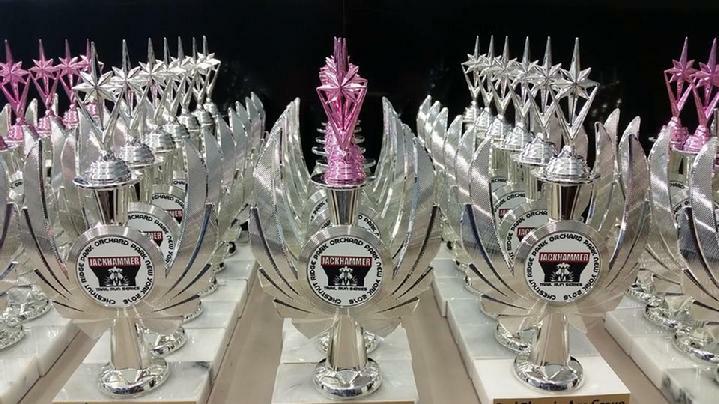 Series awards based on your best four out of five finish times. Race one or as many as you like-individual race entry is always welcome. Runners & walkers are welcome-just bring your trail shoes and get ready for some great technical trail running. The Course: Starting & finishing near the XC Ski loop runners take singletrack trails out to the main road, towards the lake, counter clockwise around the lake trail, back to the main road past fire training area where a hard right points you into a short section of single track and back out to the main roadway for the return on the XC Ski loop. Phew. This is a terrific spectator friendly figure-eight style course with plenty of close-by parking. they receive a runner accomplishment pin. Hammertime! Post-Race Fun! The Byrd House in Orchard Park once again is supporting runners with Jackhammer specials. After each race happy hour prices at the bar and $10 cheese or cheese/pepperoni pizzas for dining in (pizza is very important in our lives). Awards to Overall Male, Female & Mastsers during the series finale' party and three deep in the following age groups: U10, 11-14, 15-19, 20-29, 30-39, 40-49, 50-59, 60-69, 70+. We are going double deep in the top two larges M/F age groups as well plus great door prizes at the final series party. The two largest age groups will go double deep in awards. Individual race entry is $15. 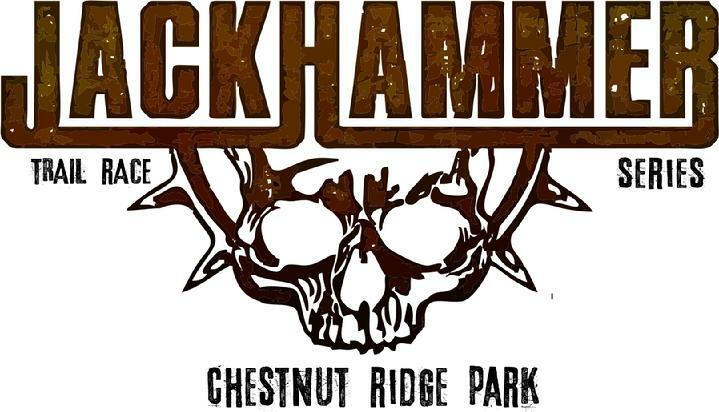 Sign up for the entire series on-line and save plus order your Jackhammer Series tech shirt as well(pre-order only). Series entry is also welcome until race # 2 on-site via entry form. Pets are prohibited on the course. Safety for our entrants and pets is a priority. Number transfers are not permitted. Can I race one or two if I don't give a hoot about the series? Yes. Is there a water station on the course? Yes-self-serve at around the 1/2 way point. Can someone use or transfer my number if I cant make a race? No. Transfers are not permitted. What if it rains? Then it rains. How to I find the start? Pass the Casino & continue on that main Park rd. You'll see the registration area just past the stone bridge. Can I wear headphones/earbuds? If you do you will need to leave one out-Seriously, safety, passing and awareness on tight trails is critical and your attention is needed for the safety of you and other competitors. What if it rains? Then it rains and you will melt. Are there weekly awards? No. Is there series awards? Yes. Will I be tired? Yes. Will I think about the race the entire next day at work? Yes. Is the course smooth? No. It's mostly trails with single-track & rooty sections, some gravel & some pavement with a few small ditch jumps that aren't too much to be concerned with right now. Anyone can do it. Can I sign up the day of any race if I don't register in advance? Yes-cash or check. What time do the races start? 6:30pm Eastern Time weekly. What will I do after the race ends? Stand around and chat with great people for a while then head to the Byrd House in OP for post-race festivities.